My friend Mr. Sherlock Holmes was a man of the most mercurial moods. He could, at one moment, expound authoritatively upon the shape of bubble pipes and the fitness and utility of various soap admixtures for their "suitability for bubbly-ness" and then, in the next, become positively entranced by the cluckling of barnyard chickens. He was at once, as I penned in "The Final Problem," both the "best and wisest weirdo I have ever known" and the most infuriating specimen of his species, whatever that may have been, that ever lived. Yet I could not deny that Holmes was, beyond doubt, the greatest consulting detective the world had ever seen and it was my great privilege and blessing to have been at his side through many adventures, both as a doctor and as his friend. "You should have some of your scribblings published, dear Watson," said Holmes to me one evening in our Baker Street abode. "You have some faculty with words, and you have long been chronicling the little problems placed before me." He blew bubbles upon his pipe and said nothing for long moments; he was a canny weirdo, Holmes, and he knew that he had planted a thought, a seed within my mind. I could not deny that I had thought of having the journals published in which I documented the many adventures of Holmes through our long association, since my dear friend Stamford had introduced us after I had returned from the front. I had need of lodgings, Holmes’ landlady Mrs. Hudson was in need of a lodger, and thus was our long association born. Holmes withdrew his bubble pipe from his lips, and he shook the stem of the pipe in my direction. "Talk to that literary agent you know, Storck. He can place your chronicles of my little problems before the public." Storck! However could I have forgotten Storck! Patrick Storck was not unknown to me, as I had read with great interest his scholarly work on Muppet King Arthur, and I had found his treatment of the Matter of Britain both perceptive and wise. "Perhaps you are right, Holmes," said I. "But you have solved so many cases in your career, I would hardly know where to begin, or which story to have published first. Should I begin with our first meeting? What of the dark affair at Baskerville Hall? Or your pursuit of the fiend Moriarty?" "Tut, dear fellow," said Holmes. "Perhaps the affair of the Stoke Moran suggests itself?" The Stoke Moran! Those were dark events, true, and all of Holmes’ powers of deduction were on display. "Perhaps you are right," said I. "I shall call it ‘The Adventure of the Speckled Band.’"
"But, Holmes," said I, "what of Inspector Lestrade’s role in the affair?" "Well, he is quite the amphibious fellow," said Holmes. "You mean that he is a frog," said I.
Holmes tutted. "Really, Watson, no need to be vulgar. The accident of his birth is hardly Lestrade’s fault. If he happened to have been born a tadpole and grew up in a pond, that it barely something to hold against him. I would no more chastise Lestrade from his ampibiousness than I would remark upon your ursine-ness." Holmes frowned. "A bear, Watson. You are a bear." "Oh, quite so, Holmes. Quite so." I paused. "But if I do place the story of the Stoke Moran with Storck, who do you think should illustrate it? Illustrated stories are quite popular with readers, you know." Holmes drew upon his bubble pipe and lost himself in reverie and reflection. "Alas, Sidney Paget and Frederic Dorr Steele are no longer with us." Finally he spoke softly and with great authority: "I am quite taken by the work of Amy Mebberson, and you may wish for the cover illustration to be done by David Peterson, as I have been quite taken by his work on Mouse Guard. Yes, Watson, that would do nicely. I think they would portray us with great flair, and I believe that Mebberson would capture well the quintessential Victorian-ness of these times, from the cobbles to the soot, from the street urchins to the nobility." I could not argue with Holmes’ reasoning. He took up his accordion, as he was wont to do, and as the evening wore on he played into the night. Our landlady Mrs. Hudson, on the floor below our Baker Street digs, pounded on the ceiling, hoping that my friend would cease his playing, and I must confess that I, too, wished that Holmes had had some musical talents, but I could not fault the passion at play in his off-key, off-tempo, tuneless wailings. He was a weirdo, true, but within that strange, beaked, blue head of his there dwelled the keenest intellect this world had ever seen. Even if it was taken, on occasion, by strange thoughts of poultry. To continue the adventures of Sherlock Holmes and Doctor Watson, your customers will want to pick up BOOM! 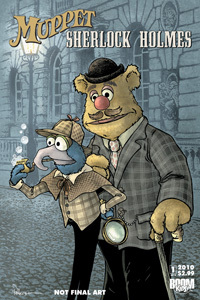 Studios’ Muppet Sherlock Holmes #1 this August. The classic detective stories of Sir Arthur Conan Doyle are given a Muppet makeover with Gonzo as Holmes, Fozzie as Dr. Watson, and Kermit as Inspector Lestrade. Written by Muppet King Arthur‘s Patrick Storck and illustrated by The Muppet Show‘s Amy Mebberson, the game will be afoot once more in this four-issue mini-series!